Another of our popular sailing odysseys where you get to explore some of the secret Caribbean whilst improving your skills and confidence on board! Make no mistake, this is full on sailing with a packed itinerary and loads to see and do! If you need to build some miles towards your sailing certificates or you just fancy an adventure, what better way than with some sunny blue water cruising from Antigua to Guadeloupe and Dominica, and then back up to St Martin via Monserrat or St Kitts? You'll also have the chance to practice and hone your skippering and passage planning skills along the way. Our 14 day itinerary will need to take into account the long range forecasts, and with a prevailing Easterly we should be on a fast beam reach much of the time. IBIS absolutely loves this kind of sailing and gives fast, comfortable passages between the islands. With plenty of stops en route to sample the local food and atmosphere this is a real blue water adventure trip to beat all others! If you want an idea of what this trip's about, see our Ship's Log of the journey going South and vice versa , and take a look at the video on our homepage. Want to follow it up with an Ocean passage ? Why not combine your stay with the start of our Atlantic Adventure from St Martin to Bermuda via the BVI's? or arrive a few days earlier and have extra time enjoying quiet anchorages of Antigua. 6th Arrival Jolly Harbour & settle onto the boat; final provisioning, evening ashore in Jolly Harbour. 7th Sail to English Harbour on the south coast to check out of Antigua; time for some exploring the picturesque and historic Nelson's Dockyard. 8th Sail to Deshaies on Guadeloupe for the evening with some time for snorkelling and ashore for dinner and exploring the pretty fishing village. 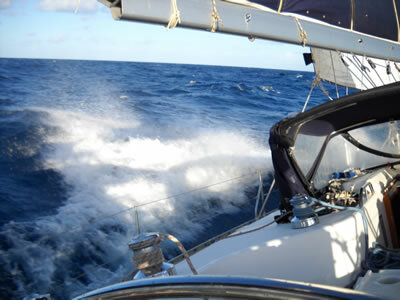 9th Sail to Basse Terre to the south of Guadeloupe. Time to go and explore the island's rainforests and waterfalls. 10th Sail to Roseau in Dominica, take the afternoon to explore a little of the town or the magnificent rain forests and waterfalls beyond. 11th Start North for Portsmouth and take a unique trip up the Indian River. Barbeque dinner aboard. 12th Time to explore the rainforests of Dominica, then sail to The Saints for dinner in an idyllic setting. 13th Set sail for Point a Pitre on Guadeloupe to check in and then follow the mangrove channel between Guadeloupe's two islands. 14th Sail to Monserrat to see its volcanic desecration and how it still maintains a wonderful beauty despite the damage. 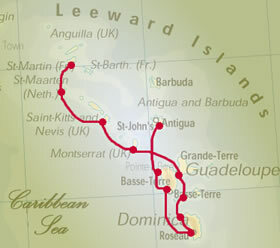 15th On to Nevis or St Kitts to explore these little visited but uniquely pretty islands. Barbeque dinner. 16th Sail to Saba & hope to pick up a bouy in deep water for a visit to "the islands that brush the clouds"
17th Sail to Philipsburg for some R&R and souvenir shopping ashore on the Dutch side of St Maarten. 18th Leave late morning for our final sail across to Marigot in French St Martin with its fine dining & classy shops. 19th Time in Marigot for a debrief, tidy the boat and say your goodbyes.